Size: 24" x 10" x 10"
Al Krogman was born and raised on a traditional central Alberta farm where he continues to live with his wife Caroline. "Although I was raised in Central Alberta I have always had a passion for the mountains and nature". I have been working in the metal medium for the past 22 years. My creations are a collection of individual pieces, which have been hand cut, forged, shaped and welded into final production. I am a true metal artisan. My sculptures are not from cast or molds, nor have been mass cut. Each piece is "truly one of a kind". 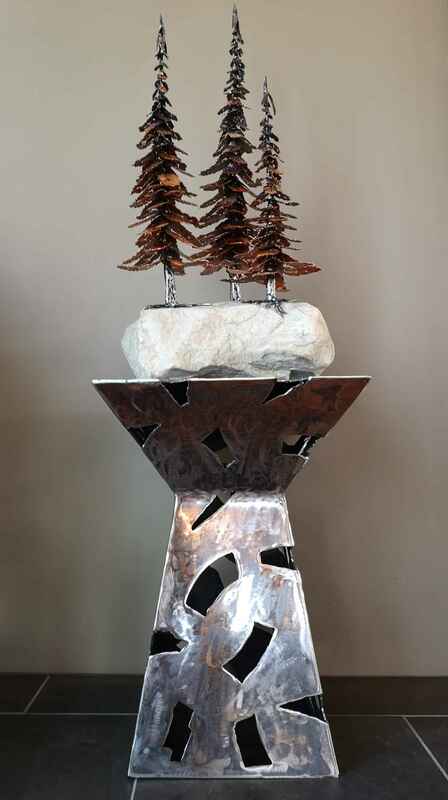 The main focus of my steel sculptures is drawn from nature, and my inspiration comes from the Divine One - Hence the name the Divine Forgery (not Forge), as I believe His work can at best, only be copied. I am a certified journeyman welder by trade, but believe the artwork I create is a gift. 24" x 10" x 10"